After a clear look at an iPhone 7 earlier this week, we now get to see how the larger variant is designed. 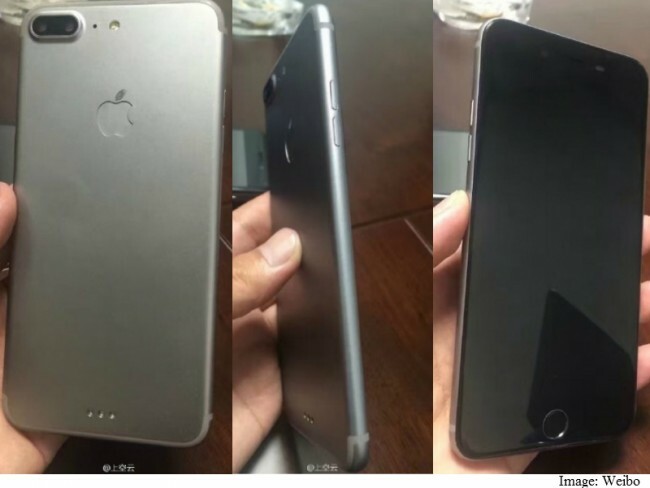 The latest leaked images give us a glimpse of the iPhone 7 Plus from all angles, confirming some key rumours about the smartphone. The image first appeared on Weibo (via GSMArena), and shows the iPhone 7 Plus from the side, front, and back. The back of the smartphone confirms the much rumoured dual camera setup. It even reveals the Smart Connector at the back (a feature that many think may not be introduced this year), and the logo also seems to be a bit different. Instead of a black Apple logo, a new carved logo sits at the back. The front looks the same, with no evident design changes. The antenna bands have been shifted to the edges, and interestingly the mute switch seems to be absent from the sides. Traditionally, Apple includes the mute switch above the volume buttons, but that seems to be missing in these images. Of course, there is no authenticity of these images so we recommend you take the news with a pinch of salt. If Apple is to follow tradition, then the new iPhone 7 will be released in September. The smartphone will be released in three variants – iPhone 7, iPhone 7 Plus, and iPhone 7 Pro. The iPhone 7 will sport new A10 processors, and the large variant will see a 3GB RAM bump to accommodate new camera hardware. If Apple decides to skip the 3.5mm audio jack, then the smartphone is expected to sport waterproof capabilities.